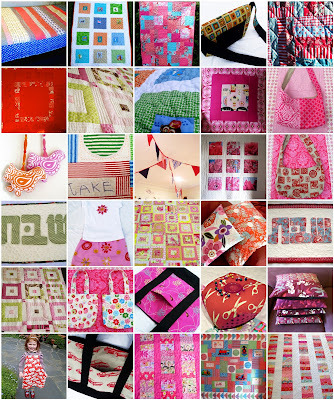 Wonderful collection of work, all beautifully made! Love seeing them all like this in a mosaic. oh, yum yum yum yum!!! I always love to see collections of work in a mosiac! You can be proud, so much yummy stuff! What a lovely quilt you have just made! You can add that to your list of achievements too. Got to learn to do this. You are a work horse! You have had a wonderfully creative year so far...especially given you planned your own wedding! Wow, you have achieved heaps! All my best colours in the whole wide world!!!! Hope you are well! I love all the Pinks. Your mosaic is terrific. You've accomplished a lot.